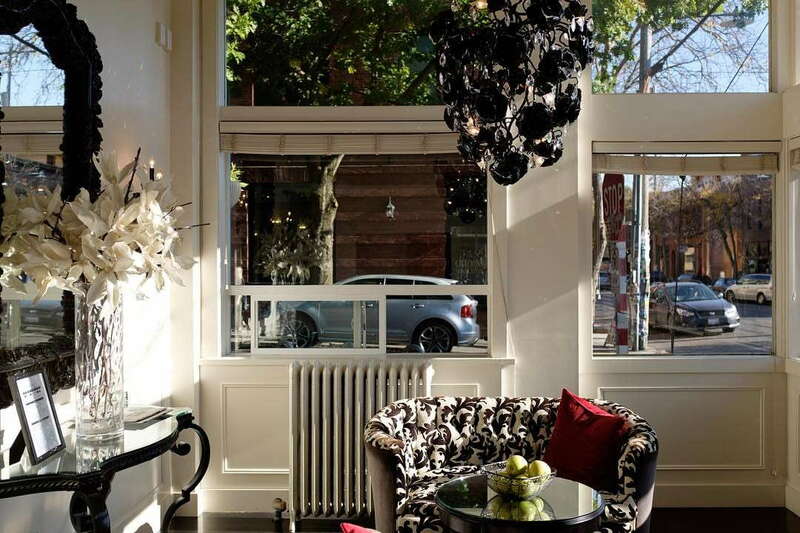 Budget travelers seeking an authentic Seattle neighborhood experience should consider this adorable inn right in the heart of Ballard, tucked between coffee shops, trendy boutiques, and restaurants. The 1909 property, a former bank, may be small at 16 rooms, but its monochromatic modern riff on Louis XIV style thinks big and bold. If snug quarters and shared bathrooms aren't a dealbreaker, Ballard Inn is a worthy lodging-on-the-cheap option. YOU SHOULD KNOW If you’re disturbed by noise, Ballard Inn might not be the best place to stay. Many rooms face bustling Ballard Avenue and guestroom walls are a bit flimsy. Small but well-appointed rooms come in twin, full, and king options with shared baths. Deluxe king rooms come with a private en-suite bathroom. 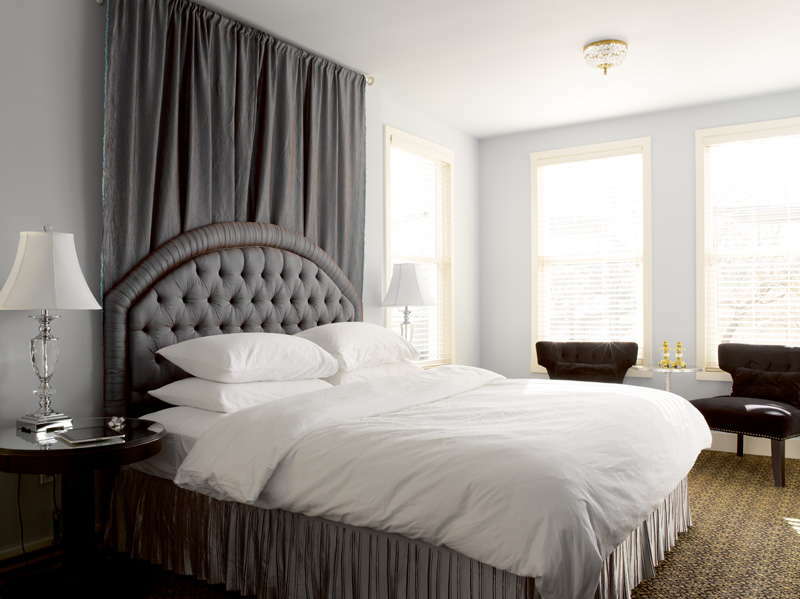 Simple décor includes embellishments like tufted headboards and antique chandeliers, and all rooms include amenities such as flat-screen TVs and goose-down comforters. Shared guest bathrooms, including powder and shower rooms, are conveniently located and lockable. Deluxe rooms with en suite bathrooms cost more and book up quickly. A punchy black-and-white palette suits the tiny space, which includes a pair of loveseats in a black-and-white baroque pattern and an ornate mirror and a giant chandelier in glossy black. Parking at Ballard Inn is $15 per day with inn-and-out privileges, which is cheap by Seattle hotels standards. Guests can access the two pools at the nearby Olympic Athletic Club. A stay at the Ballard Inn includes complimentary access to the Olympic Athletic Club a few doors down. The beautiful 50,000-square-foot facility is one of the city's best gyms, with tons of equipment and classes, as well as two separate pools. It’s worthwhile to have a car if you’re staying in Ballard – parking at Hotel Ballard costs $15 a day, far less than Downtown hotels, which charge as much as $50. It’s a 15-minute drive to Seattle Center and a 25-minute drive to Downtown. For bus transit, the D Line runs from Ballard to Downtown (approx. 40 minutes), with stops in Seattle Center. Uber and Lyft are also popular options for visitors. Foodies will flip for Ballard’s dining options, many within a few blocks of Ballard Inn. Two of Seattle’s most famous chefs, Ethan Stowell and Renee Erickson, both have several outposts in the area, including Stowell’s Staple & Fancy (5-minute walk) and Bramling Cross (1-minute walk), and Erickson’s Walrus & the Carpenter (5-minute walk) and Barnacle (same building as Walrus). Ballard’s nightlife scene caters to all types, from the divey Sunset Tavern (5-minute walk), which features live bands and movie screenings, to The Noble Fir (3-minute walk), a beer and wine bar with an outdoor aficionado theme and a library nook filled with travel books. Ballard also has a booming craft beer scene, with a fast-growing list of breweries and taprooms in the neighborhood. Reuben’s and Stoup (8-minute walk) are two of the best. Chic and affordable, the Euro-style Ballard Inn offers solid value for design-conscious travelers on a budget who don't mind sharing a bathroom. The Ballard neighborhood, once a sleepy Scandinavian fishing village, is brimming with cool bars, eateries, and boutiques -- and far more locals than tourists. Two perks make the inn especially appealing: relatively cheap parking and complimentary access to one of the Seattle's top health clubs a few doors down.